Apple offers three network routers: the AirPort Extreme, the Time Capsule, and the smaller AirPort Express. The AirPort Express is also Apple's least expensive network router, clocking in at $99.  The AirPort Express is a hand-sized network router that creates an 801.n-compliant Wi-Fi network. While it's not as fast and not as powerful as the AirPort Extreme, it still produces a dual-band network, transmitting at both 2.4 and 5 GHz frequencies to support newer and older devices. If there's a part of your home or office that has poor or non-existent Wi-Fi, the AirPort Express can help. It can operate in tandem with an AirPort Extreme to extend the range of the AirPort Extreme's network. What's more, the AirPort Express is AirPlay-compliant. An analog/optical 3.5 mm jack on the back of the AirPort Express lets you connect it to a stereo receiver, amplifier or other audio source, and any AirPlay-complaint app on your Mac (like iTunes) or iOS can be used to stream audio to the AirPort Express, to fill your home with music or whatever else you like to listen to. A built-in USB port lets you share a USB printer with Macs and PCs on your network even if the printer doesn't support networking itself. The printer shows up on your network and can be configured in the Printers & Scanners system preference. There are also two 10/100baseT Ethernet connectors - one to attach to your cable modem and one that can be used for a hardline network connection with other devices. The AirPort Express supports a wide range of security protocols and is interoperable with computers and devices that support other Wi-Fi protocols like 802.11a, b and g.
With support for up to 50 users, the AirPort Express can be used in a home, school or small business. Some folks can get away with it as their only wireless network router, but if you need larger area coverage or faster speed, the AirPort Extreme is your best bet. If you have Apple's — recently discontinued — Airport Express, good news: It now works with AirPlay 2. That's Apple's updated, multi-room aware, streaming technology. The same one used for HomePod and Apple TV. Where to buy an AirPort Wi-Fi Router — While supplies last! While Apple had discontinued the AirPort Time Capsule, AirPort Extreme, and AirPort Express Base Stations, they'll still be available for sale while supplies last. Here's where! AirPort Express, AirPort Extreme, and AirPort Time Capsule will continue to be sold while supplies last but then Apple is done with the router business... at least for now. Today Apple released updates for all its Wi-Fi base stations, including the AirPort Express, AirPort Extreme, and AirPort Time Capsule. Upgrading your router? You don't have to destroy your Wi-Fi network in the process. Here's how to quickly replace your old device with an AirPort. Is Apple making a faster AirPort Express? Apple Time Capsule vs. AirPort Extreme vs. AirPort Express - which router should you choose? The Wars, AT&T Mark the Spot, Cribbage Lite, Doodle Jump, Airport Express -- TiPb Picks of the Week! Should Apple Resurrect The AirPort Extreme?